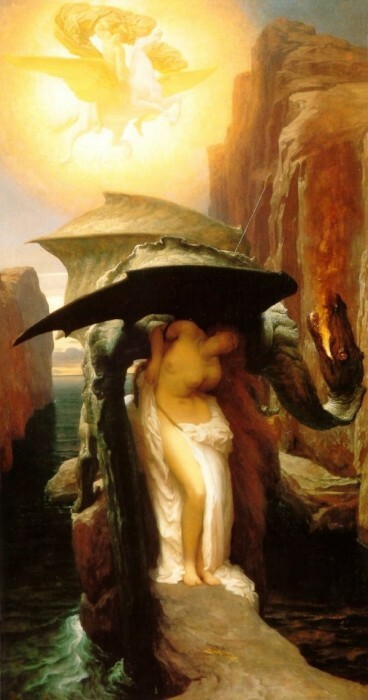 Perseus and Andromeda, by Frederic Lord Leighton. Read more about Perseus and Andromeda. Lord Frederick Leighton also painted mythological figures like Actaea, Alcestis, the Hesperides, Aphrodite, a Bacchante, Clytie, Daedalus and Icarus, Demeter and Persephone, Helen, Iphigenia, Lachrymae, Leda, Nausicaa, a river nymph, Perseus, Psyche, a Siren, and a Sybil.